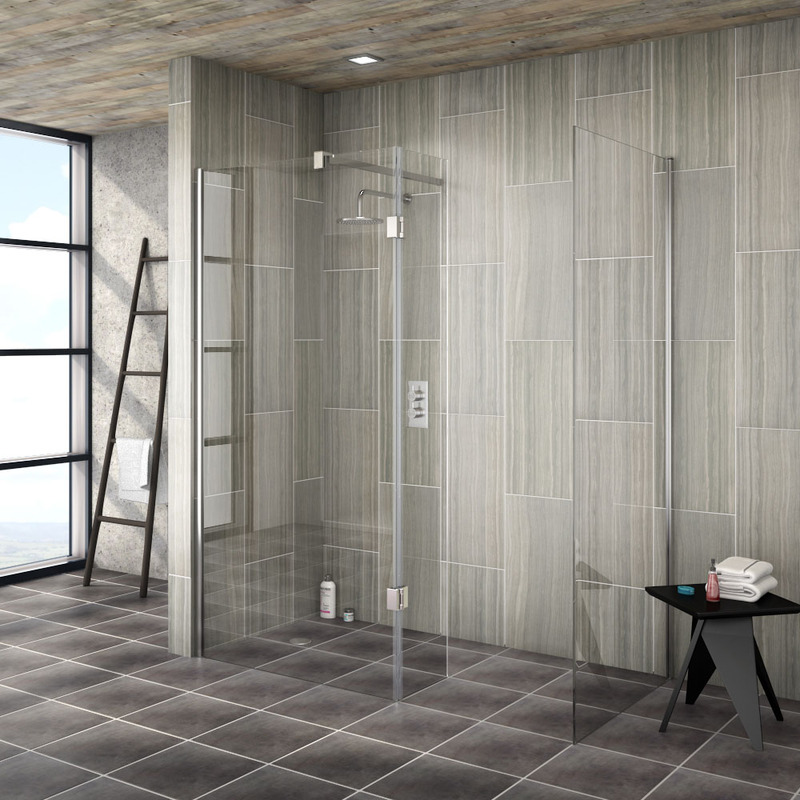 The thought of a shower raining down on your bathroom floor may sound like a miniature nightmare, but the truth is wet rooms are fast becoming a huge trend in the UK! Posted By Alan, 24th May 2018. 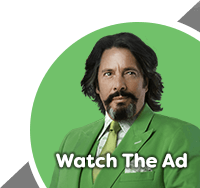 8 Minute Read. We couldn’t let the April showers go by without talking about wet rooms and shower rooms! Added to the fact that Summer should be on its way soon and many of you will be telling yourselves it’s time for a new shower! If you enjoy the practicality of a shower then you’re going to love these wet room ideas that we’ve got for you. What is a wet room I hear you ask? Well, put simply, a wet room is a specially created area of a bathroom or dedicated shower room where the showering area is an open space. There’s a huge variety of wet room styles around but they essentially revolve around a shower, mounted on the wall or from the ceiling, and a waterproof area below featuring a shower waste, for the water to drain away and escape. Everything else is essentially up to you and this is where you’ll generally need a bit of wet room inspiration. A wet room can be installed in both small and large bathrooms, an ensuite, loft or even as its own shower room or cloakroom. To help you create the perfect shower room design in your home, our experts here at Victorian Plumbing have put together 6 Awesome Wet Room Ideas to work in any bathroom! To kick-start your creativity we believe that the shower that you’ll use in your wet room is quite possibly one of the most important decisions you’ll make. 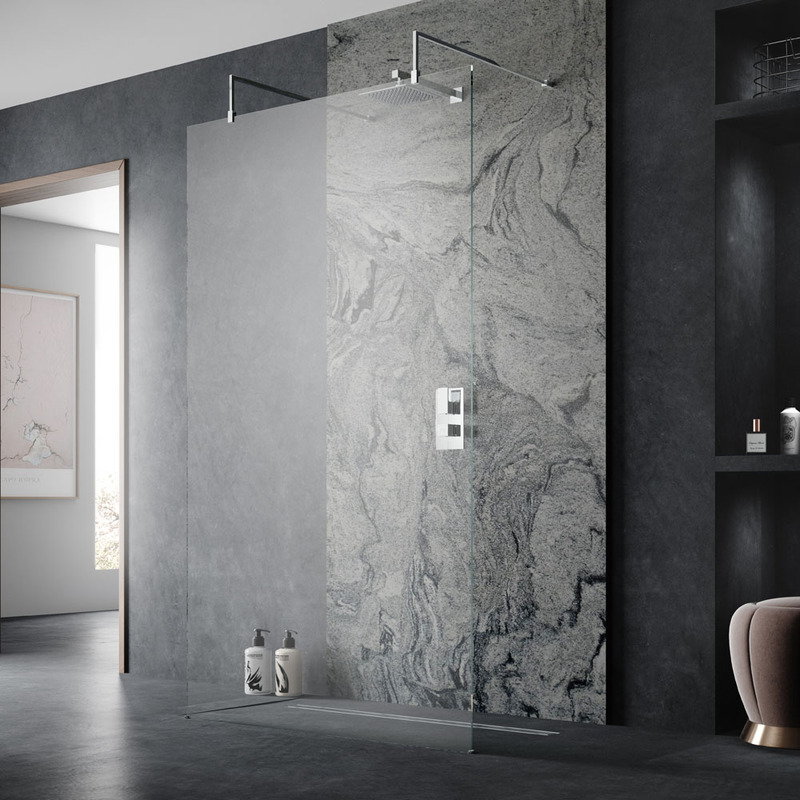 The idea of a wet room is to provide a quick and easy showering experience, but that doesn’t mean that it can’t be a luxurious experience as well. These wet room shower ideas are beaming with style! A rainfall shower head is larger than most and literally does what it says on the tin... or box in this case. It’ll create the effect of rainfall overhead, the only difference is this water is temperature controlled to your liking so you’ll probably never want to come away from the shower. For an even more invigorating experience why not consider a ceiling rainfall shower head (pictured). These are even larger shower heads and literally give the impression that you're under a rain cloud. 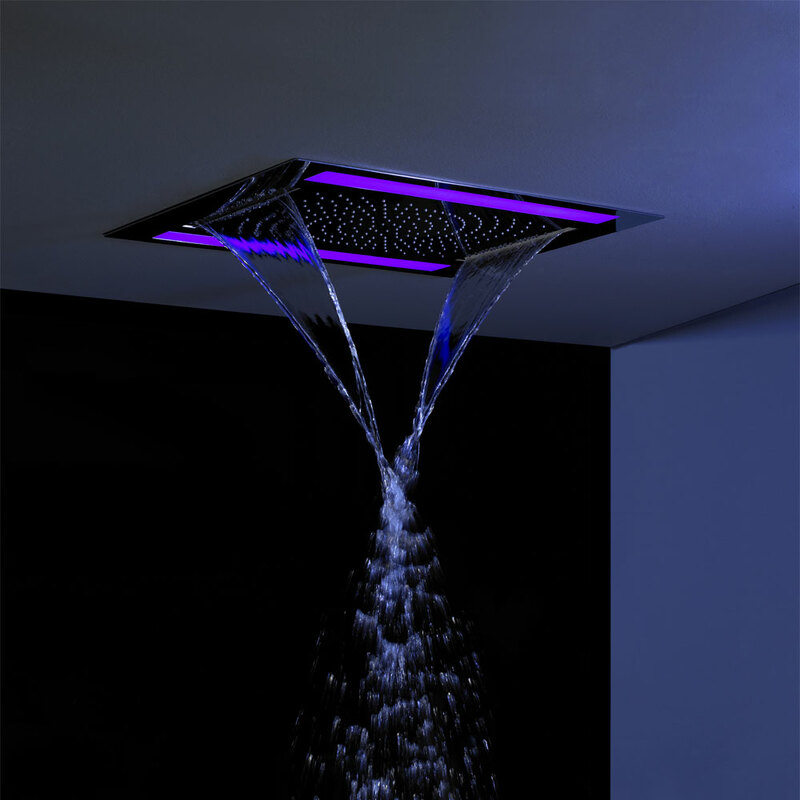 This one with LED technology gives a whole new meaning to light showers! One idea that we strongly recommend is body jets. These will add a spa feel to your shower with a massaging function. Showers with a great power or flow rate will probably need a strong water pressure. If your shower seems a little bit weak or it's reduced to just a dribble then a shower pump will fix your problem! If you want to know more about shower pumps why not read our shower pump guide? When you’re planning your wet room design it’s crucial that you’re walls and floors are suitable for the room. Everything will require waterproofing around the wet area and one of the best materials for decoration are tiles. There are hundreds of stunning designs around and pretty soon you'll find the idea of tiling your wet room irresistible. If your space is large then you’ll have the luxury of many options for wet room tile ideas. Grey tiles are currently one of the most popular colours and it’s not hard to see why. Try using two different styles and shades of tile for a contrasting look; and for some added beauty, consider different tile shapes such as large square tiles against large rectangular tiles. If you’re looking for small wet room tile ideas to create an eye-catching feature then we suggest using patterned tiles. In smaller wet rooms such as ensuites and cloakrooms you can run the pattern from floor to ceiling which will create the illusion of a larger space! When it comes to wet room design ideas, one of the easiest and striking things that you can do is create a feature wall. It allows you to highlight the shower area whilst adding a totally stylish look. You can choose tiles for the feature wall, although shower wall panels can be a much simpler and cost-effective option. You can get a similar look like the one above with this stunning Mineral Oxide shower panel design. 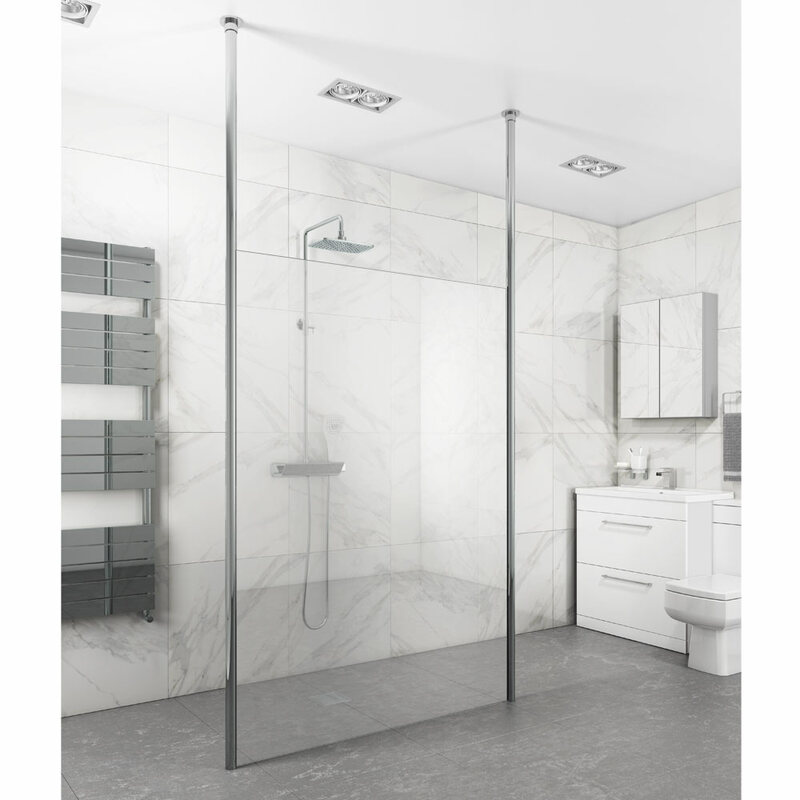 Many wet rooms simply feature a showering area which is open, but if you would like to keep the water contained then a shower screen is a stylish wet room idea to consider. 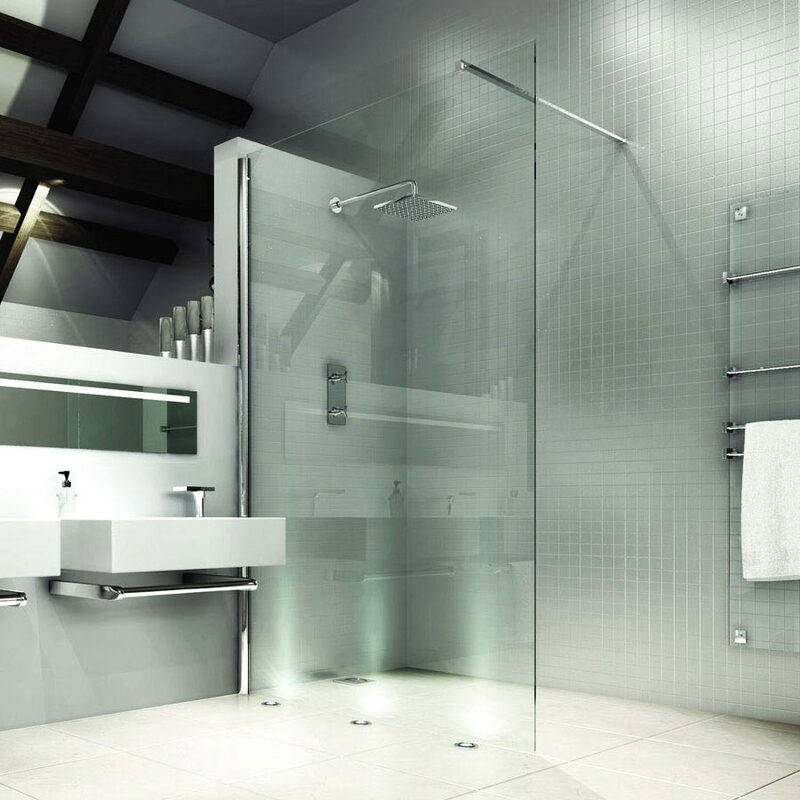 A large glass shower screen will look stunning in a large bathroom, whereas a tiny space will appreciate a smaller screen. The best thing about glass screens is that they are totally clear and easy to clean, so a small wet room will still appear to sparkle when it’s maintained, whilst retaining that spacious feel. Another bonus with shower screen panels is the wide variety of shower screen supports. These useful support arms, also known as support bars, help keep your shower screen sturdy and safe, but they’re also perfect for adding a unique look with a range of styles to choose from. Another important consideration when planning a wet room is the type of fixtures you’re going to use. Attempt to keep as many items off the floor by selecting wall hung options such as toilets, furniture and basin. When it comes to furniture, an awesome idea would be to use a wall hung vanity unit. They will remain dry when water ends up soaking the floor and it’ll also look ultra-stylish. We recommend handleless units with a gloss finish for a totally modern bathroom, but the look is always up to you. 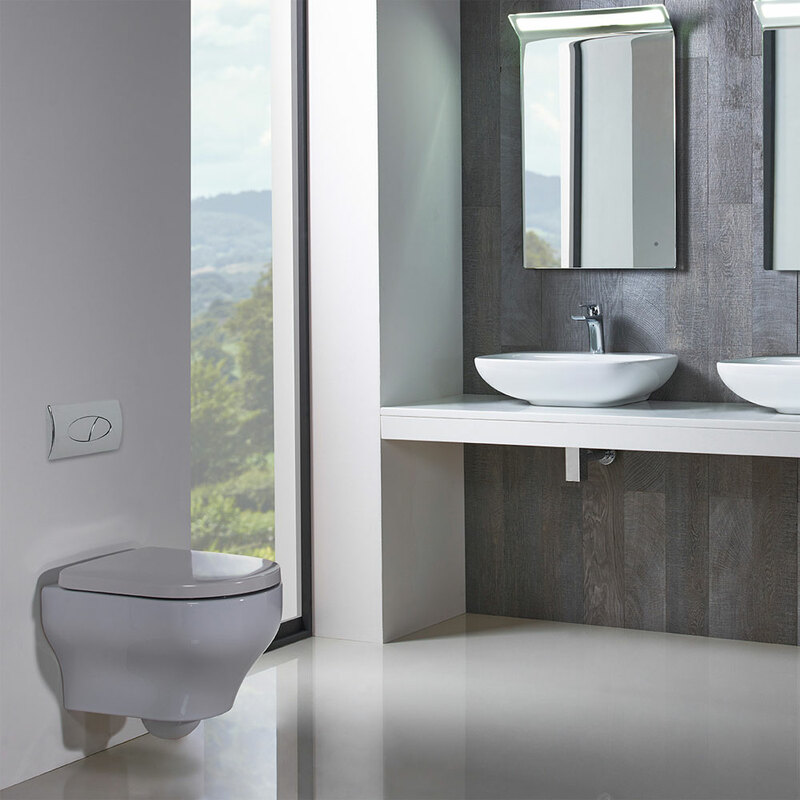 A wall hung toilet will not just look awesome alongside your other wall hung furniture but it’ll make cleaning and maintaining the area a doddle too! If you’re looking for small ensuite wet room ideas then wall hung fixtures such as toilets will also help to give the illusion of a larger space. Lastly, there’s your basin. You could choose to save space by combining your vanity unit and a basin or you could simply choose to have these separate. If you have the space and the budget, it’s hard not to be inspired by a double vanity unit. This incorporates two units with two sinks; perfect for partners who want their own space. Another great idea for your wet room is to use a shower tray. This will keep the water from going all over the floor so if this is something that is putting you off choosing a wet room then this could be an ideal solution. The beauty about wet room shower trays is that there are lots of styles to choose from. They come in a variety of colours; to help you colour coordinate with the rest of your room, there's a range of materials; for additional strength, durability and feel, and there's a massive selection of sizes, shapes and heights; including low profile options for a sleek finish. If a wet floor is undesirable to you then a shower tray will work wonders, plus there's many trays which feature drying areas (pictured above). Many shower room designs don't actually feature a shower tray and instead have a sloped floor design which channels the waste water towards a drain. If this is an idea you're considering for your wet room then you'll need a showerlay, also known as a wet room tray. The showerlay lies beneath your tiles or flooring and contains a waste where the water can escape. If you're decorating your wet room floor with tiles then make sure the showerlay is ready for tiling. We hope you’ve taken lots of inspiration from these 6 wet room ideas. Remember, a wet room is designed for practicality in mind although larger spaces afford you the luxury of adding items such as luxurious freestanding baths. This will create an elegant setting with a combination of functionality and comfort; something everybody can appreciate we’re sure! Need more ideas and inspiration for your bathroom? Take a look at these modern bathroom ideas if you’re planning a contemporary look or check out our traditional bathroom inspiration for something timeless! 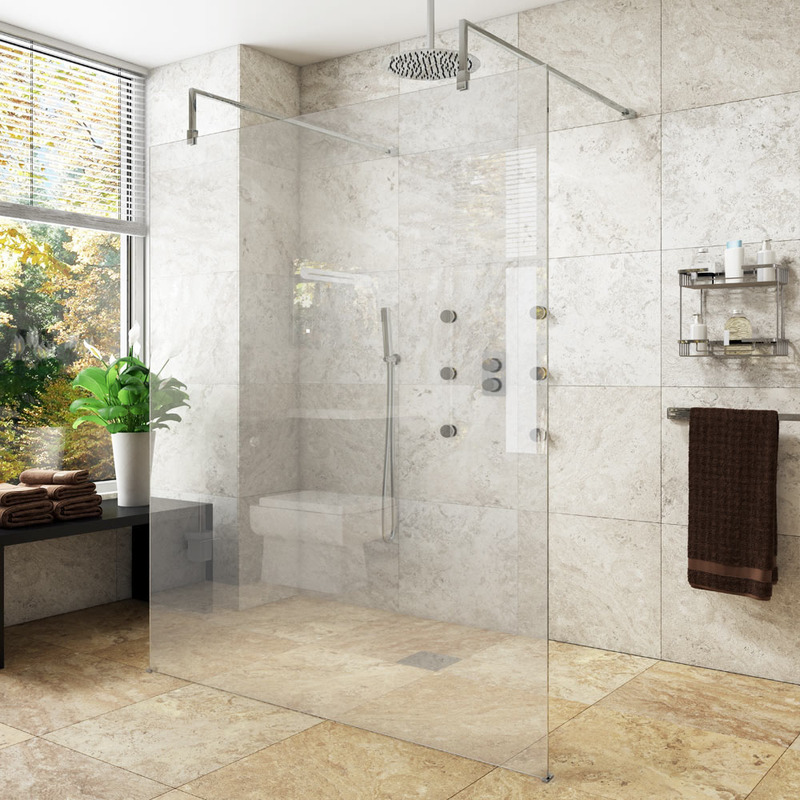 What Makes Mira Showers Different?